The current economic situation has not prevented foreign investors from once again looking to Spain when seeking a destination for their business initiatives. In fact, direct foreign investment shot up by 62% in 2011, making Spain the fourth-placed European country in terms of attracting projects of this type over the past year, behind the United Kingdom, Germany and France. These figures represent a turning point for Spain, where foreign investment levels had fallen in recent years. This is one of the most important conclusions to be drawn from the Ernst & Young report entitled European Attractiveness Survey 2012 as far as Spain is concerned. The report combines analysis of international investment in 43 European countries in 2011, with over 840 business executives from around the world surveyed, giving their opinion on how and where to invest internationally over the coming decade. In 2011, Spain received a total of 273 foreign investment projects compared to 169 in 2010, creating a total of 9,205 jobs, a 19% increase on 2010. This has meant that Spain has climbed a number of places to fourth in the European table in terms of attractiveness to investors. 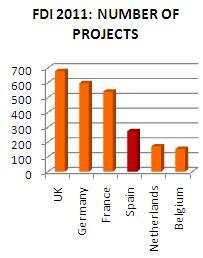 Its market share of total foreign investment in Europe also grew from 4% in 2010 to 7% in 2011. As far as individual sectors were concerned, investment projects in the Spanish Services and Software sector have been those deemed to be most attractive, followed by Food and Drink, Transport and Plant & Equipment. In terms of the most attractive European cities for project investment, Barcelona and Madrid occupy the third and fourth places respectively, according to the report. As in previous years, US investors are Spain's biggest customers, representing 19% of the total number of projects registered in 2011, followed by German, French, British and Dutch financiers. According to José Miguel Andrés, CEO of Ernst & Young Spain, “despite the economic difficulties we are experiencing, the report highlights the fact that foreign investors see Spain as an attractive destination which offers good returns on capital thanks to, for example, the size of the country's economy, the quality of Spanish communications and transport infrastructures or Spain's very highly qualified workforce. For this reason, Spain needs to continue with the reforms which seek to increase market confidence and which make the country a highly competitive destination for investment”.